RealityCheck is the best skill-based social gaming platform for fans to compete in single-day or season-long online games across a wide variety of reality tv shows. 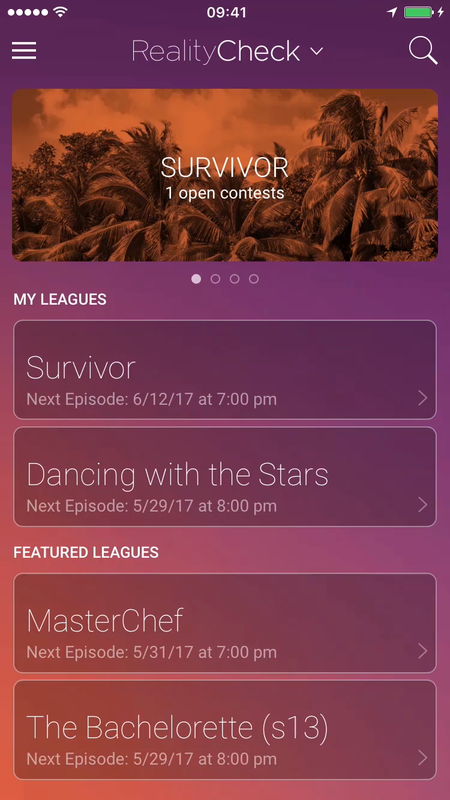 The basic service of the app enables players to earn points with their predictions regarding events and actions within specific episodes. But more than a simple game, RealityCheck serves as an all-in-one hub for the reality tv viewership to participate in communities with their friends or anonymous participants worldwide, to explore and share news related to their favorite shows, and to discover new programs. RealityCheck is currently only available on iOS. Once we've tested everything during the beta test, we will develop a companion Android app and a web app. Follow us on social media to receive updates, or send us an email with specific inquiries. Thanks for registering! You will be invited to download the RealityCheck Mobile app for iOS once we've added you to Apple's TestFlight system. Look for an invitation email coming soon!